Last night, Raf Simons summoned the devoted to New York Mart, a Chinatown grocer with a Comic Sans sign known for selling nutritious proteins like pig heads, duck organs, fresh fish, and live frogs. We were in the outdoor area in the back – “where the pigs get slaughtered?” I asked a show producer. “No comment” was the reply – which had been decked out in spellbinding, Blade Runner fashion. Simons had strung up dozens of Chinese lanterns screen-printed with Joy Division and New Order graphics, as well as scrolling LED signs that said things like TOO HOT, TOO BIG, FUZZY LOGIC. Points for self-awareness. Last season, Raf made his New York debut at the Gagosian Gallery, an all-white space that hewed closely in layout and atmosphere to his Calvin Klein show later in the year. This season, his decision to take us to the muggy, neon-lit alleyways under the Brooklyn Bridge felt like a restatement of purpose: he came from the underground, and underground he shall remain. At least, aesthetically. 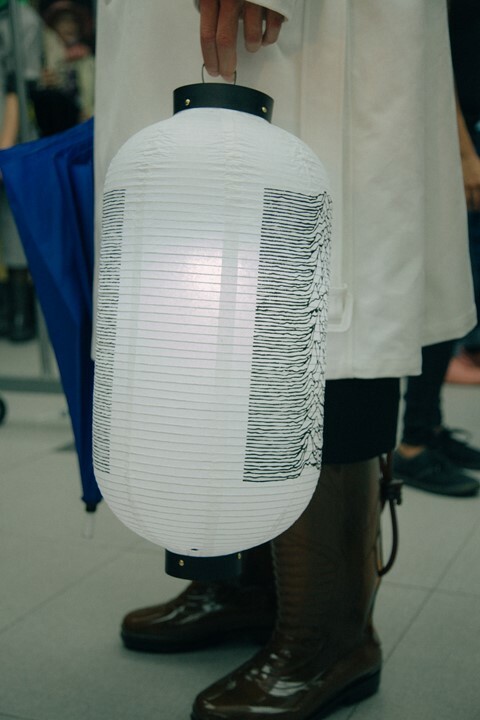 Every model carried an umbrella, some clear vinyl and others screen-printed nylon. Some of them came tattered and falling apart. 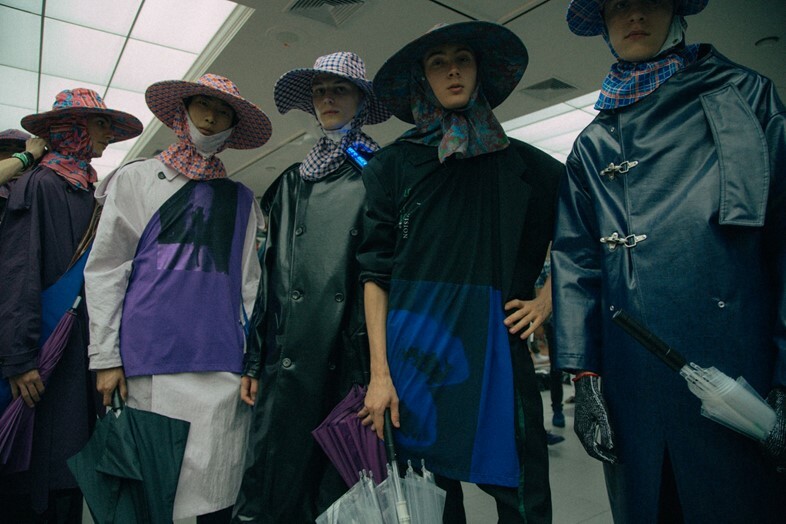 The collection was flush with toggled rain slickers and gum boots. Before the show, producers spilled buckets of water onto the ground to give the space a rain-soaked glimmer. This morning, a trillion-tonne iceberg broke away from the Antarctic peninsula. Cartographers will have to re-draw maps. 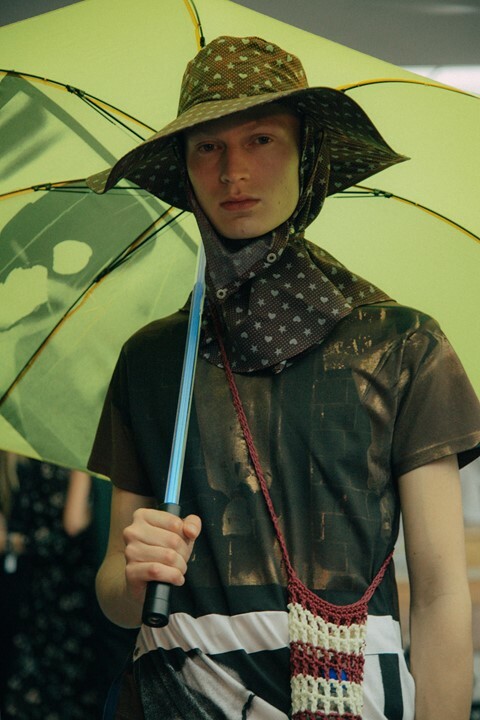 Global warming is not a joke, and the way in which many leading designers are embracing waterproof fabrics is both practical and borderline frightening. Choked by humidity, the impulse behind the splatter-proof styling made sense to us. We all felt like we were swimming standing up anyway. Simons’s obsession with Peter Saville’s graphic design is not news. In 2003, Simons presented his iconic Closer collection, which sampled Joy Division’s imagery on everything from knit sweaters to canvas parkas and motorcycle jackets. Recently, he tapped Saville to redesign Calvin Klein’s logo. An art director involved with the show design told me that Saville worked on the Chinese lanterns himself. Naturally, I asked if I could have one, bartering everything from money to favorable show coverage (I really don’t care at this point). Alas, I was told that all of the lanterns were being transported back to Belgium for Raf’s personal archive. Most of them were industrially rigged with lighting and impossible to detach. When I saw one showgoer manage to pry one loose and run out of the venue with it, I was both happy for him and fuming with envy. Front 242 kicked in on the P.A. system and models began emerging from a blue-lit fog. Chinese lanterns glowed red, and signs saying REPLICANT glowed in every direction. Clearly, the show was designed to resemble a scene out of Blade Runner...and it did. The 1982 Ridley Scott epic is officially having a renaissance, its fingerprints everywhere from the (criminally underrated) live-action Ghost in the Shell to this month’s Valerian and the City of a Thousand Planets. Of course, it’s also the 35th anniversary of the film and a long-awaited sequel, Blade Runner 2049 is hitting theaters this autumn, directed by Denis Villeneuve. All of this is to say, if you haven’t brushed up on the original cyberpunk spectacle, now would probably be a good time.